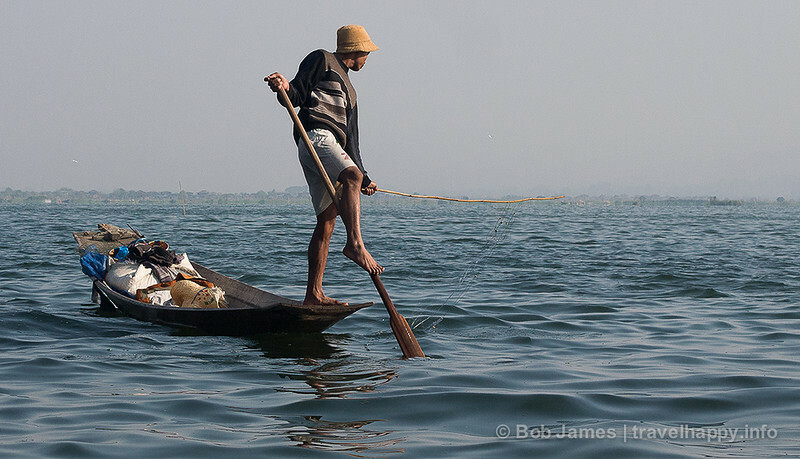 Children growing up on Myanmar’s Inle Lake first learn to walk, then to pilot a boats. There are no roads here. If you want to go to work, the market or just see a friend, you go by boat. 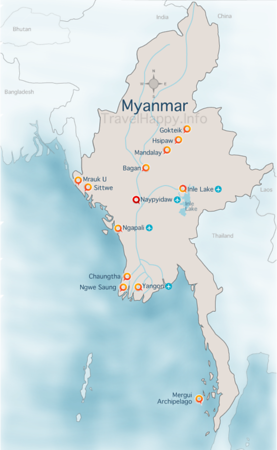 The same holds true for tourists: If you want to experience the former Burma’s most-unique region, you’re going to need a boat guide. The following is a guide of what to see and do at Inle Lake – if you want information about How to get to Inle Lake and Where to Stay, see Travelhappy’s previous Inle Lake Orientation post. If you’re looking for Inle Lake hotels, check Agoda for availability. Your day will start around 8 a.m. the next morning. Besides a camera and sunscreen, you’ll also need warm clothing; it may have been roasting in Bagan, but it’s cold on the lake. Dressing in layers is best, as you can strip down as the day gets warmer. Inle Lake tour agents and guides have a well-established route for tourists, but following it will leave you less than satisfied if you’re trying to explore “real” lake culture. Although Myanmar attracted only about 300,000 western tourists in 2011, Inle’s tourist route is small and very much overrun with boats full of foreigners. If you’ve arranged a private guide, also create a private itinerary, dropping points that likely will be packed with white faces can be a smart move. On the North Lake, a couple of stops can (or should) be outright skipped. Hpaung Daw U Pagoda – This is rated by some as the No. 4 temple in Myanmar, which says a lot considering the stupefying number of stupas in the country. But its only feature is a set of over-gilded, almost unrecognizable Buddha images. Unless you’re really into temples, you can skip the crowds here. Floating Market – This market is for tourists only. Few locals actually shop here, so there’s little to gain from the crowds of foreigners and Buremese souvenir peddlers. built on stilts or float on the water’s surface. Nampan, principally a bedroom community for fishermen, is one of the larger ones on the North Lake and early in the day you’ll see kids as young as 3 or 4 paddling around, women doing laundry or even bathing (with clothes on) in the lake. With my constant photo-snapping and requests to slow down, my young guide figured out what I wanted to see and, instead of heading back out into the lake, pulled into another Burmese village next to Nampan and then an Intha village behind that. The cultural pecking order was much in evidence here, with Nampan’s clear lake water and lush embankments giving way to muddy rivers and rougher landscapes. Just north of Nampan is In Phaw Khone, a working village devoted to silk, cotton and lotus root weaving. Sure, it was a a bit of a tourist trap, complete with store at the end of the tour, but the weaving didn’t stop when the tourists left and the vast majority of the finished products were sold at local markets, not in the gift shop. 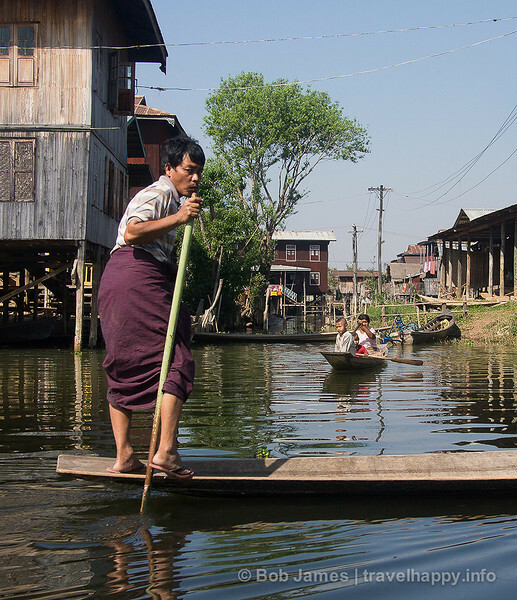 WIth no land to grow crops on, Inle residents have built their own “floating gardens.” The man-made plots are about a meter deep and supported with bamboo. Your guide will invite you to step out, but be careful: It’s like walking on a waterbed! After lunch comes the concession to tourist traps: the so-called “Jumping Cat Monastery.” (see the Jumping Cat Monastery video from a previous Travelhappy post). Officially known as In Phaw Khone, the giant teak building on stilts is home to only four monks, who maintain the building using donations from their trained-cat shows. For small donations, they’ll come out to have their kitties jump through hoops and do other tricks for food. Be careful not to come at lunchtime or during prayers, as the shows won’t be available. The cats will be lounging around on mats, though, if you want to try an entice them to jump. After a longish ride back up the lake toward Nyaungshwe, you’ll get the grand finale of the day: Maing Tauk. This is a village with a split personality: half is on water, half on land. It also boats a 500-meter teak bridge similar to Amarpura’s U Bein Bridge, only not nearly as long or high. You’ll pull up to the bridge and invited to go ashore for a walk through town, which consists of just two dirt roads. You’ll see women carrying cords of firewood on their heads, schoolkids in uniform getting out of class and the obligatory foreign couple that pedaled on bicycle from Nyangshwe. Near the water’s edge women are working in the fields and, if you’re there late enough, you’ll catch fishermen returning from the lake and, if you’re lucky, even a sunset over the water. They’re all simple-life scenes, but the scenery is so beautiful and the atmosphere so relaxed, you’ll float away from Inle Lake feeling you’re truly experienced something unique.